Advertised as "the most powerful Mac ever," the iMac Pro provides an impressive set of hardware specs, packing Xeon processors with up to 18 cores, 22 Teraflops of graphics performance, as well as a 27-inch Retina 5K display. Earlier today, Apple unleashed a new iMac all-in-one computer. 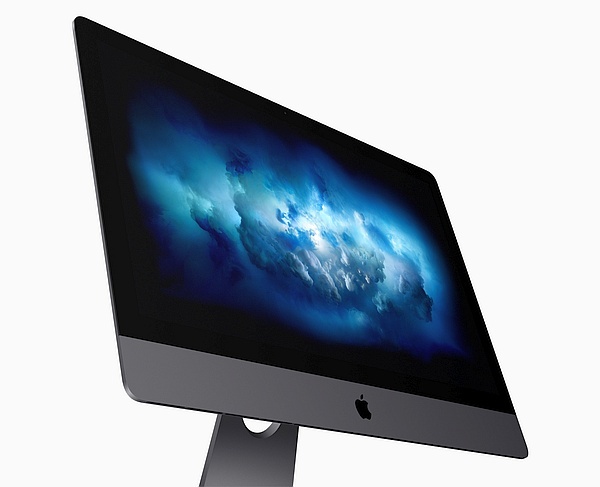 Simply known as the iMac Pro, this compact machine comes with impressive specs and starts at no less than US$4,999. Since we already talked about the imminent arrival of the iMac Pro yesterday, let us take a closer look at the hardware options available: Intel Xeon W processor with 8, 10, 14, or even 18 cores, 27-inch Retina 5K display with 500 nits brightness and 5,120 x 2,880 pixels, Radeon Vega Pro 56 (8 GB HBM2 memory) or Radeon Vega Pro 64 (16 GB HBM2 memory) graphics, 32 GB, 64 GB, or 128 GB quad-channel DDR4 memory, 1 TB, 2 TB, or 4 TB SSD storage, Thunderbolt 3 digital video output, stereo speakers and four microphones, 10 Gb Ethernet, and more. In addition to the iMac Pro itself, the retail package contains the following items: one space gray Magic Mouse 2 and the Magic Keyboard with numeric keypad (also in space gray finish), a power cord, and a Lightning to USB cable. Those not happy with the Magic Mouse 2 could go for the Magic Trackpad 2 (US$50) or could just grab them both for US$149. Described by Apple as "the fastest, most powerful Mac ever made," the basic iMac Pro comes with an octa-core Xeon processor, Radeon Pro Vega 56 graphics, 32 GB RAM, and 1 TB of SSD storage, this "affordable" setup having a price tag of US$4,999. However, the top model could be configured with an 18-core Xeon processor, Radeon Pro Vega 64 graphics, 128 GB RAM, and 4 TB internal storage. In this case, the price tag would be... ehem, US$13,199. The new iMac Pro is not available for pickup from Apple's retail stores yet, and those who place their orders now will have to wait up to two weeks for their units to ship.